How can we live with wildfire? The wind has calmed the Four Mile Canyon fire from September 2010. The now cold embers have started to decompose and represent what was once a house. Boulder County will burn again. Wildfire has increasingly become an annual condition encroaching upon communities throughout the west. 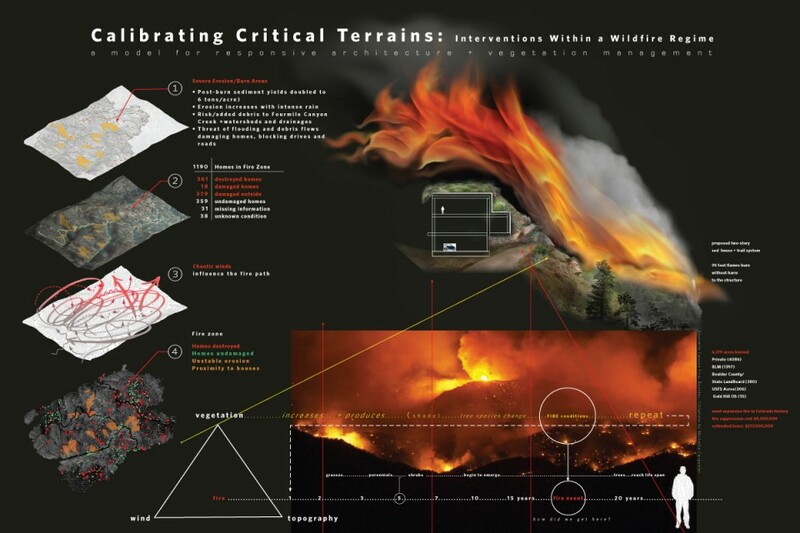 Wildfires are at an all time high in the summer of 2013 and designers must ask how can we design for wildfires and deal responsively with this issue? The smoke from the Four Mile Canyon has cleared. Some will leave and some will stay to watch a community burn again, then rebuild the same way? There is a systemic problem of repeating actions that result in the same kind of outcome. There is a beauty in it’s dry vulnerable self, a critical terrain that we yearn to be next to. Fire suppression over time has manifested itself in a gradual build up of fuels. Evidence of weak mitigation and has encouraged a denser growth and a species change than what is typical for this Montaine ecosystem. Fire resistant Ponderosa pines planted too closely encourage a shade canopy of tree like Douglas Firs that burn quickly allowing a fire to move faster. This buildup over time leads to a fire event that is devastating. Gradually the system resets itself only to repeat the avoidable event. 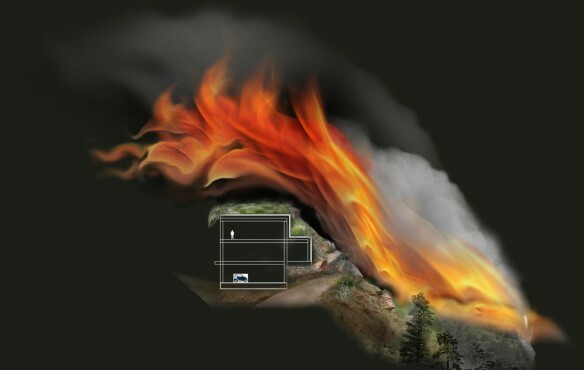 Fire typically moves quickly up a steep slope and once it reaches the slope, according to scientific modeling it breaks apart to the left and right. Pinched earth like a gully acts like a compressed furnace-like funnel for the fire to travel fast and hot. The solar aspect of south-facing slopes allows vegetation to dry out providing a crispy snack for a hungry fire. Cooler and wetter at the bottom of the slope, and along the main road more houses survive. My designs propose a program of responsive landscape architecture. Architectural choices can play a decisive role in affecting the cycle of fire suppression, the build-up of fuels and the major fire event. 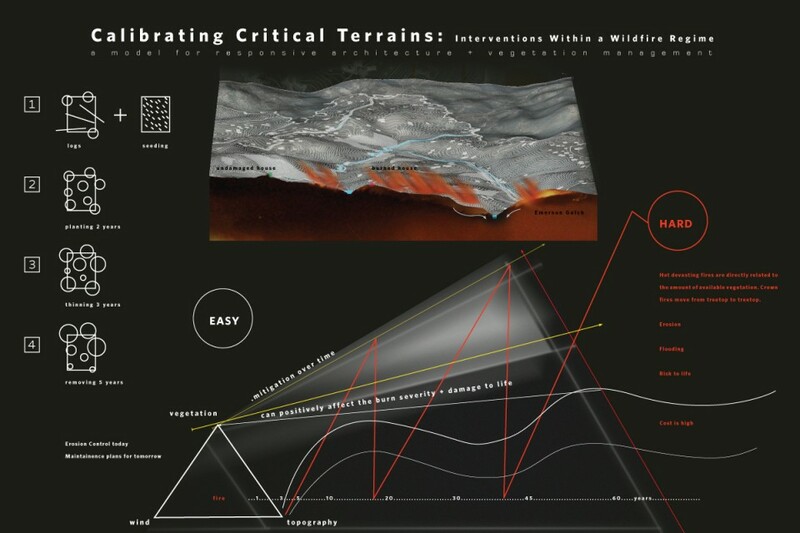 Understanding the intricacies of the terrain and the microclimates in conjunction with wildfire can provide clues how to design for this critical terrain over the course of time. 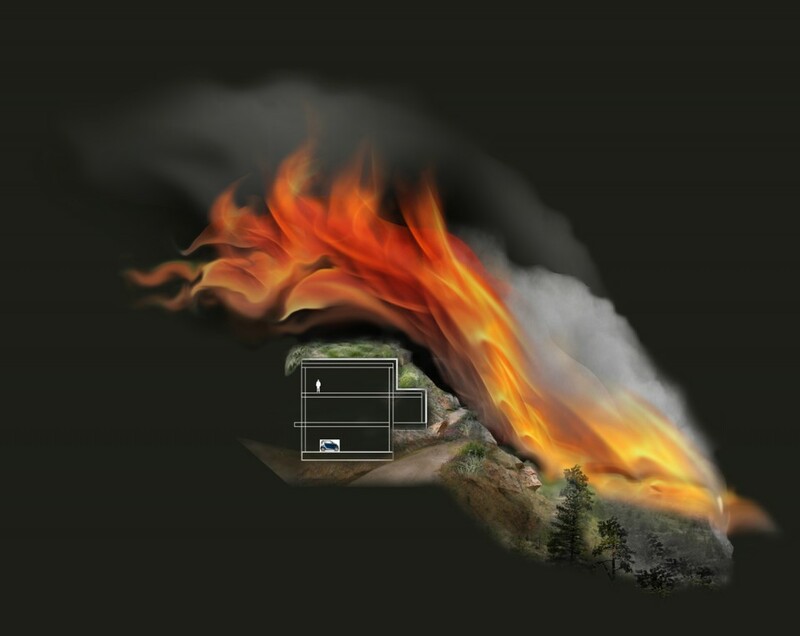 I have proposed three concepts: 1. a visual framework model for communicating how mitigation can affect the intensity of a fire. 2. an architectural sod home solution 3. fire management practices to lessen erosion and to stabilize slopes and protect creeks from flood events. This proposal looks to scientific modeling and encourages wildfire to go over top of the home, breaking at it hits the ridge, lessening the damage to property and life. Mitigation is an important practice but is ineffective as a sole solution. It provides a misguided notion of protection to the community. There is a connection between the communication graphics, historical logos associated with wildfire and how they no longer serve to communicate to the communities and our culture. I am proposing a new visual identity system followed by responsive architectural design solutions to address how our culture lives with wildfires.